HowMechanismWorks ? : What is the Purpose of a Car Air Filter? How do you know it is time for an air filter replacement? What is the Purpose of a Car Air Filter? How do you know it is time for an air filter replacement? When you talk about car engine air filter might not be the first thing that comes to a person's mind but it is always plays a vital role in keeping your cars engine healthy.The air filter is important to the efficiency of the engine because of the need for air. All fuel burning engines require a constant supply of air in order to function properly. The main purpose of an automotive air filter is to filter and clean outside air before it gets sucked into a car engine and burned along with fuel to produce combustion.The right amount of air mixed with the fuel improves performance considerably.Air filters make certain that the intake of fresh air does not contain any debris. This includes dust, pollutants, and other particles that can cause problems within the engine.Clean air mixes well with the gasoline and generates a higher MPG. To put it in perspective, you can compare an air filter with your nose as it filters out foreign particles before the air reaches your lungs, ensuring that the respiratory system can function properly.Same case with air filter also if the air filter are not good in your car then the amount of air intake to engine will decreased , then engine has to work harder and will consequently expend more fuel. This results in lower MPG and higher costs at the fuel pump. The economy realized by a clean air filter is reason enough to periodically change it. How do you know it is time for an air filter replacement? Strange engine noises due to the lack of air flow from a dirty filter. Even if you don't notice any problems, you should always replace the air filter according to the owner's manual.Some people recommend getting an air filter replacement every 3,000 miles, though others say mileage is not as important as checking to see how dirty the filter is. You should consult your car owner’s manual for the manufacturer’s recommendation. In addition, you can ask someone who knows about cars, such as an experienced mechanic. The important thing, when it comes to your air filter, is that you do not neglect it. An air filter replacement is pretty cheap and can end up saving you money on costly repairs in the future. By cleaning air filters it improves the quality and quantity of clean air entering the engine, and this improves the engine performance and efficiency. Dirty air filters will not allow the same amount of air to enter the engine as a clean one would. Studies have shown that fuel economy can be improved by up to 14 per cent with a clean air filter. A clean, properly installed and functioning air filter increases both engine performance and gas mileage. By filtering incoming air into an engine, an air filter ensures that air burned inside of an engine is as clean as possible. Clean, purified air ignites quicker and better inside of an engine cylinder, an occurrence that increases engine combustion efficiency, which increases fuel economy. 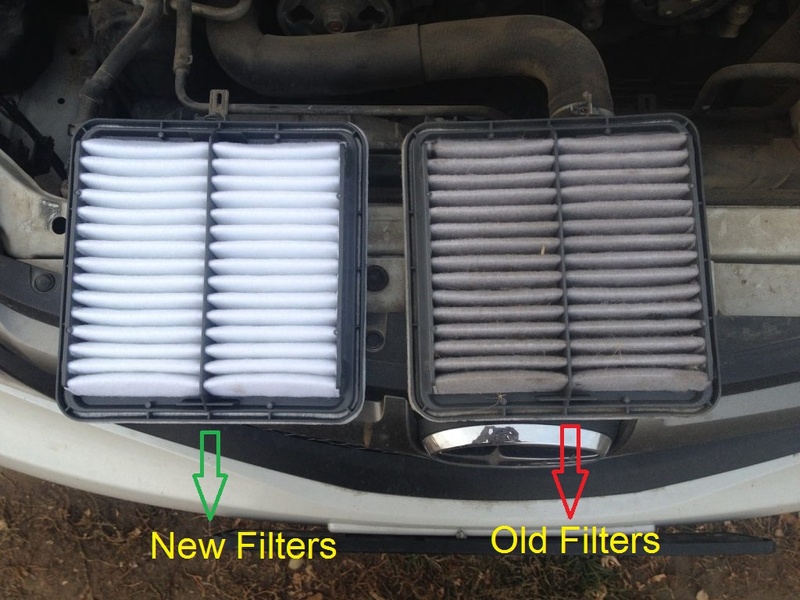 Regularly changing the air filter is an inexpensive way to extend the life of an engine. Small particles of dust or sand can cause damage to internal parts such as pistons and cylinders. A carburetor or fuel injection system is responsible for injecting both gas and air into an engine's cylinders, a combination more commonly referred to as an engine's air/fuel mixture. Both carburetors and fuel injection systems use tiny portals and valves to function. Any debris or obstruction that enters these portals and valves can cause serious malfunction and/or damage. An engine air filter protects these delicate parts by filtering incoming air before it enters a carburetor or fuel injection system. An air filter is one of the cheapest and easiest parts to fit. In fact, many people choose to change their own air filters themselves.